We are very excited to announce that we will be participating in the 2016 edition of Rick Altman’s Presentation Summit taking place in October 23rd to the 26th in Las Vegas. Year in and year out, the Presentation Summit provides an amazing slate of speakers guaranteed to up the game of anyone involved in creating presentations at any level, in any industry. This year’s lineup is particularly notable due to the presence of the illustrious and massively talented Nancy Duarte (Slide:ology, Resonate, Illuminate). 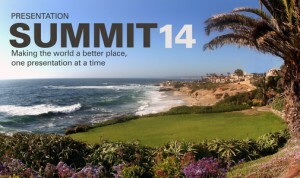 No other conference comes even close to the Summit in providing high-impact learning experiences. You will also have an opportunity to network with a uniquely knowledgeable and generous community. SlideSource.com is proud be a Gold Sponsor this year so we will have a table in the exhibitor area and our own Bob Befus will be sharing a few words before Tuesday’s General Session. If you already plan on attending and would like to schedule a personal demonstration of SlideSource.com, email us at info@slidesource.com.